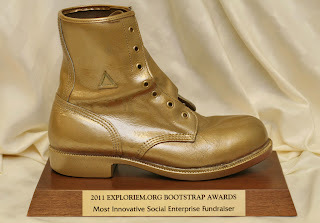 The Ottawa Humane Society (OHS) has won the 2011 Exploriem.org Bootstrap award for Most Innovative Social Enterprise Fundraiser. Bootstrap and Adawe trade show in Ottawa on February 11. The award was given in recognition of the communications and social media strategies used in the OHS Breaking Ground Building Campaign—a fundraising campaign for the new shelter, launched in March 2009. "We're honoured to receive this award. Social media is always a major part of our fundraising activities, particularly with the Breaking Ground Building Campaign," says Bruce Roney, Executive Director, Ottawa Humane Society. "As a non-profit organization, we have limited human resources for fundraising; social media lets us quickly and effectively reach a much larger group of supporters, in ways that are efficient and convenient for them and for us." The campaign, now at 84% of its goal, uses a dedicated website that showcases events, media, and YouTube videos, and allows online donations and pledges. Donors can view and direct their donations toward equipment, rooms, fixtures, or other naming opportunities. The campaign also sends a monthly electronic bulletin to 30,000 supporters to highlight ways to give and provide regular construction progress updates. Facebook, the OHS blog, and Twitter are all used to answer questions and provide timely information about the campaign. The campaign also makes use of personal fundraiser web pages that the OHS sets up on behalf of donors to encourage peer-to-peer fundraising through community events. These pages allow friends and family to show their support for a specific person's efforts to raise funds for the new shelter.